Your book is my constant companion. Flowers are friends to me; reading Ruth surrounds me with their individual fragrance and bountiful beauty. Your book is my constant companion. 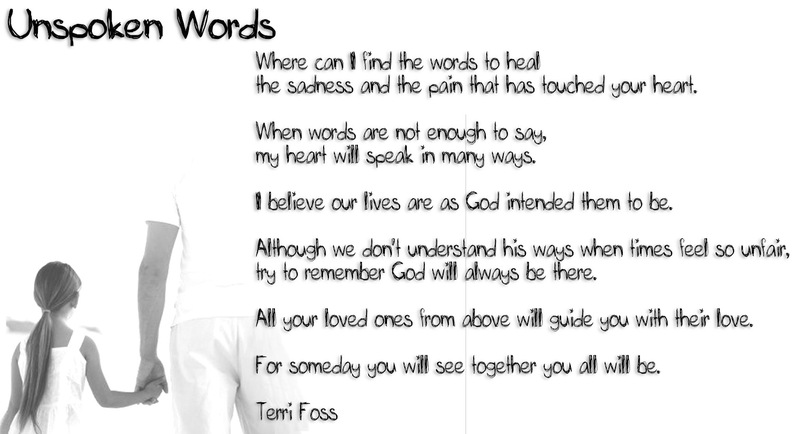 Here’s a beautiful poem by Terri Foss, of Washburn, WI. Where can I find the words to heal the sadness and the pain that has touched your heart. When words are not enough to say, my heart will speak in many ways. I believe our lives are as God intended them to be. Although we don’t understand his ways when times feel so unfair, try to remember God will always be there. All your loved ones from above will guide you with their love. For someday you will see together you all will be.